Se vante d’en estre le guide. A beu de l’onde Aganippide. Que Garnier paye les espices. Boasted of being our guide in this art. Has drunk best of Aganippe’s waters. After yesterday’s Alexandrines for Aeschylus, we have octosyllables (tetrameters) for Euripides! (Note, incidentally, that we have also had decasyllables (pentameters) in one of these sonnets – Ronsard is keen to show his virtuosity in the context of framing Garnier’s tragedies!) Estienne Jodelle, another friend of Ronsard’s represents the earlier school of French drama; it is generally agreed that Garnier’s work was a major step forward from Jodelle’s. 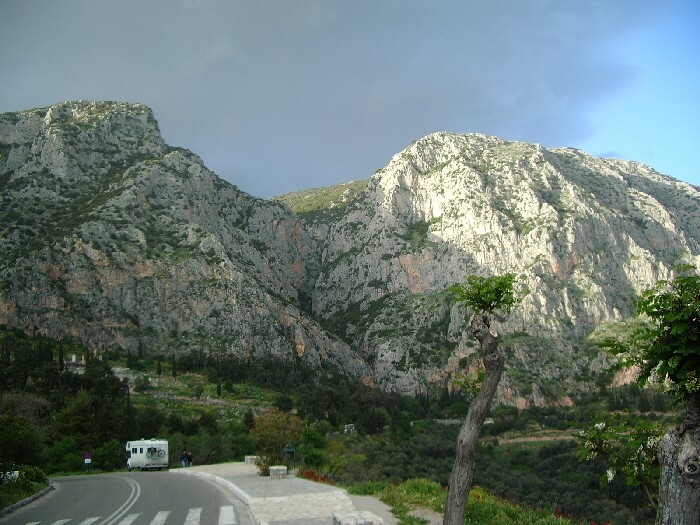 Aganippe is the name of the spring at the foot of Mount Helicon, home of the Muses; in fact, the Muses were sometimes called the ‘Aganippides’ (children of Aganippe) & it would be perfectly possible to translate “l’onde Aganippide” as ‘the Muses’ waters’. The last line deserves a brief note: literally, “Garnier must pay the spices”: although judgement was supposed to be free at the time, it had become the custom for the winnder of a trial to reward the judge in spices or other rare foods. For some reason the fact that it was food not money seems to have made it seem acceptable and not a form of bribery! So, as Garnier must pay over the spices to the judge, he must be the winner of the legal contest. While Ronsard is thus consistent in his use of a legal metaphor throughout, I have opted for ‘take the prize’ which is better suited to a sporting contest: apologies for mixing my metaphors and misrepresenting Ronsard! That brings us to the end of this set of 4 sonnets. Now it must be time to take up the first book of Amours, for Cassandre, again and return to the poetry with which Ronsard made his name. Par l’enfant bien souvent s’honore le parrain. Plus dur contre les ans que marbre ny qu’airain. Trois fleuves qu’Appollon en trois esprits assemble. Bien qu’ils ne soient pas grands, font une grande mer. Through the child the godfather is often honoured. Stronger against the years than marble or bronze. Three rivers which Apollo gathered in three spirits. Even if they are not great, they make a great sea. I find the beginning strangely attractive – ‘il me souvient’ not ‘je me souviens’. I’ve tried to capture something of its oddness by saying not ‘I remember’ but ‘I am reminded’. In line 7 his name/renown is to ‘fly’ as far as Scythia in the east and the Moorish peoples in the south. [A] ROBERT GARNIER, Prince des poëtes tragicques. Eut vouloir de luy faire entonner sa puissance. Tu te plais à chanter le cruel qui t’offence. Pour trouver (mais en vain) encor un tel sonneur. Chose to make it thunder of his power. You pleased yourself in singing of the cruel one who struck you. To find (but yet in vain) another such singer. Marty-Laveaux doesn’t print this dedicatory sonnnet to Garnier in his book; so this is Blanchemain’s version. We’ve met Garnier before: Ronsard wrote a series of sonnets to go at the front of Garnier’s own works as they were published; here is one dedicating Amours 2 to him. Garnier responded after Ronsard’s death with a magnificent elegy. 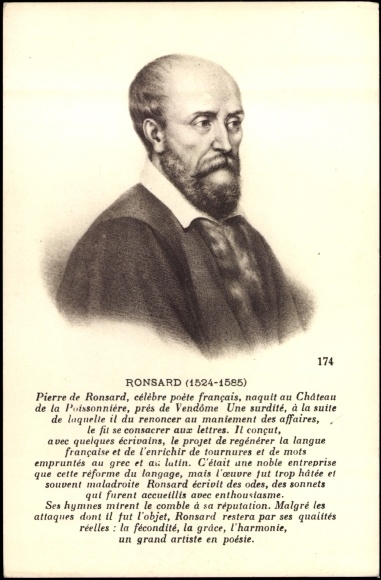 Ronsard shows how he takes ideas that many another poet has played with, and re-knits them into a work that is entirely new and fresh – while still managing to flatter and extol the dedicatee! Though Garnier is best known as a tragic poet (as Ronsard’s dedication reminds us), his first published work was the “Plaintes amoureuses” of 1565 – three years before his first tragedy, and written while he was still a 21-year-old law student. (The book has now been lost.) In fact, apart from his “Hymne de la Monarchye” (and his “Elegy to Ronsard”) poetry by Garnier outside his tragedies is still hard to find. Comment au departir adieu pourroy-je dire? Dictes, Maistresse, hé que vous ay-je fait ! Ha Mort, en quel estat maintenant tu me changes ! Hé n’est-ce, mon Pasquier, hé n’est-ce pas grand cas ? Mais voyez, mon cher esmoy ! Mon Dieu ! mon Dieu ! que ma maistresse est belle ! Que dites-vous, que faites-vous mignonne ? Qui est ce livre ? – Estranger. – Qui l’a faict ? Veux-tu sçavoir, Bruez, en quel estat je suis ?